Last night I was lucky enough to visit Leeds’ latest Spanish offering, Iberica, just prior to it’s official opening night tonight – Friday, 15th April. Be warned – this blog post is going to go on and on about how much I enjoyed the sumptuous surroundings and the food we ate. If you’re hungry and/or cannot fit a visit to Iberica into your plans for the near future, you may want to stop reading now! With sister restaurants in Manchester and London, I admit that I was expecting the usual sheen (and, quite frankly, mediocrity) of a well-polished chain restaurant. My unfair presumptions were completely unfounded. Located in Hepper House, a wonderfully intriguing old listed building that used to be an auction house, Iberica looks set to be the jewel of East Parade. Iberica sparkles and entices from the outside, and as you are ushered through their sumptuously decorated entrance spaces and bar towards the main restaurant, the beauty only heightens. Service was exceptional from beginning to end. We were warmly welcomed, divested of our coats and led to a comfortable area in the bar to await our table, advised on the many aperitifs (there’s a whole page of Gin and Tonic options, I kid you not) and then guided to our table for the night. We sipped our various cocktails and enjoyed the atmosphere, nibbling olives (very Spanish – a bit tinned, though…) whilst awaiting out table. I am a strong believer in foregrounding the food wherever I go; I am not one who can be won over by looks alone. At Iberica Leeds, however, your surroundings really do add something special to the whole experience. Though a menu curated and created by three Michelin Star-awarded chef Nacho Manzano should always be exciting enough, the opulent surroundings elevate this still further, making for a wholly unforgettable experience. And so, we headed for our table, and towards the food! We opted to seven tapas dishes and two main meals, between four. We then shared two desserts. We were all absolutely stuffed, so unless you have an exceptionally large appetite, this should be about enough for you too. The menu reaches far above and beyond the average tapas or pintxos restaurants you may have visited, but without betraying a quintessential “Spanishness”. You will still find wonderful seafood, the persistent smoke of paprika, rich aioli and Spanish meats and cheeses available through the menu, but delivered in a contemporary and exciting way; a new take on modern Spanish cuisine. My hibiscus and cardamom gin and tonic saw me through the first few tapas, and then we moved onto a porron of white and one of red. The albarino was a perfect choice for all the fish we ordered, and the tempranillo bossed up to the couple of richer dishes nicely. The tapas came to the table as they were ready. We went heavy on the fish, because they all sounded so tempting, but the meat options looked excellent too. I sort of wish we’d have tried some of their meats and cheeses too…but we needed to leave some items on the menu to try next time, aft er all. For our tapas, we enjoyed the most succulent calamari (with aioli) I think I’ve ever eaten in England, and beautiful fried fish with Spanish-style chips and a verdant, herby Canary Island-inspired green mojo sauce. Next came rolled swordfish and razor clams. 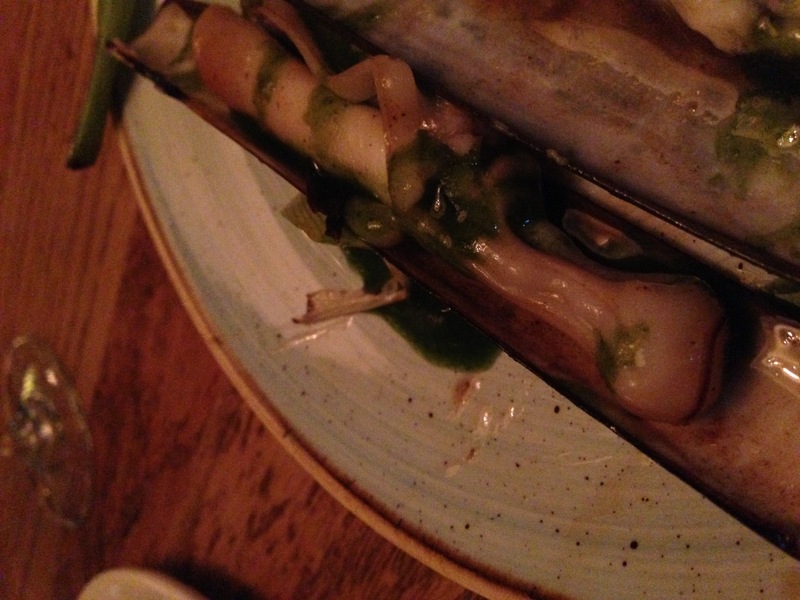 Whilst the swordfish sauce was a little too muddied and rich a flavour for my palate, the razor clams were brilliant. I didn’t get a good shot of the razor clams – (not that my photos are ever completely stellar) they flew away too quickly towards the mouths of my discerning eating companions! I’ve enjoyed razor clams before, in a restaurant very close to my heart in Venice when we lived there, and I thought they were unsurpassable. For me, these were even better. The octopus was widely proclaimed a favourite, with the perfect texture and that Spanish paprika offering just perfectly balancing the potatoes.So far – excellent ingredients, clean tastes and simple methods all combined to make the perfect tapas. We also opted for the loin of pork, and the Iberica croquettes, which made us nostalgic for Deia, Majorca, where we’d eaten the best croquettes ever. These came in not too far behind. The subtle flavour of serrano ham permeated the rich, creamy decadence of the filling, all enclosed in a deep-fried exterior. Literally nothing not to love about that! The loin, too, was tender and flavoursome, and was perfectly balanced with the moruno sauce, which again was streaked through with paprika. I’m not entirely sure the aubergine was there in enough quantity to have a massive impact on the dish, though. For mains we had ordered the Fabes with fried artichoke and the Butifarra – basically, one dish of white beans and another dish of a Spanish version of sausage and mash (Cringe at this oversimplification …*now*). I’m not sure if the beans were Judion, but they were fat, creamy and white, well-cooked and sat in a parsley sauce, and the fried artichoke were a great complement. One of my companions proclaimed this the best dish – it wasn’t my favourite, but only because of the other stellar options I’d made my way through. The Catalan Butifarra dish too was tasty but not my favourite – a tasty Spanish sausage on potatoes with cabbage and Spanish pancetta on top. We then moved onto dessert. Churros were absolutely non-negotiable, as they conjure up memories of breakfast treats with my dad after an early morning swim in the sea, and we opted for the tocinillo de cielo as our second dessert. 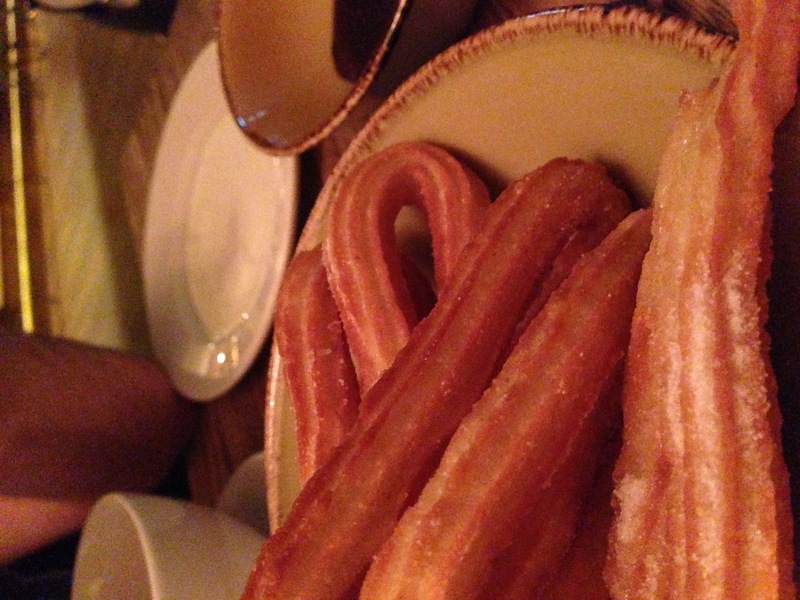 The churros were nice enough but lacking enough of that final sprinkle of cinnamon sugar, and the tocinillo was an interesting choice – an egg yolk-rich flan with complementary lemon and salted caramel flavours. We may have indulged in a digestif or two as well, and some coffees. Overall, Iberica made me reconsider my judgments about cheap-and-cheerful decor. Yes, food should always take centre stage, but the beautifully designed interiors of Hepper House really upped the ante on an already really enjoyable experience. The atmosphere elevated this from a properly enjoyable, well-cooked and well-c onsidered meal to the sort of place you go on the most special occasions. 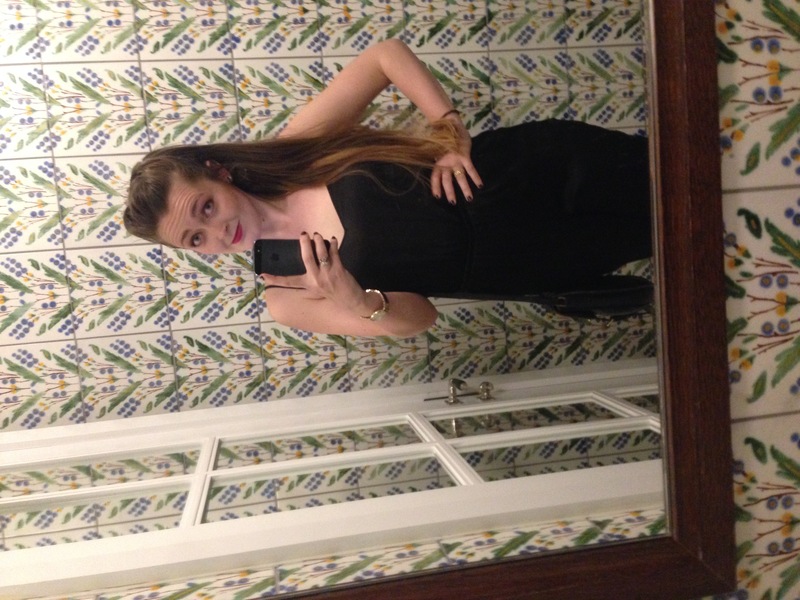 As you can see, I am a classy type – so impressed by the bathrooms that I took a picture…but really, you can’t say no to those wonderful tiles and the bright refracted light from mirrors taking up every other wall and surface! We were well fed and well looked-after (my only criticism being perhaps the over-zealous attention to removing plates and glasses which were *almost* done – always check with the diner first before whisking away!). 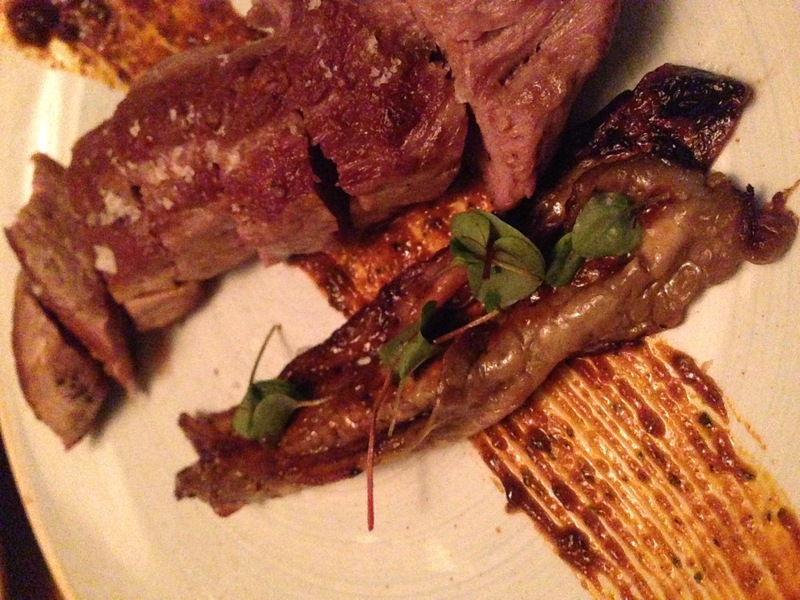 There are only a handful of restaurants in Leeds I opt for when I want to make a night feel really special (so far, Man Behind the Curtain and Gaucho’s feature heavily) – but, last night’s experience of Iberica put them right on this list for me.